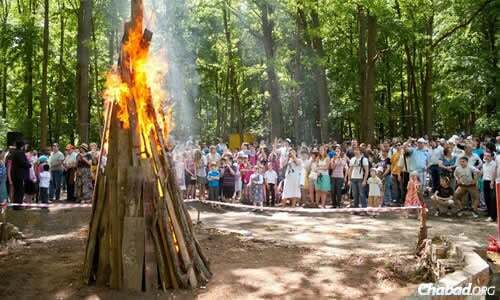 Lag BaOmer, the 33rd day of the Omer count—this year, May 23, 2019—is a festive day on the Jewish calendar. It is celebrated with outings (on which children traditionally play with bows and arrows), bonfires, parades and other joyous events. Many visit the resting place (in Meron, northern Israel) of the great sage and mystic Rabbi Shimon bar Yochai, the anniversary of whose passing is on this day. Bonfires are a traditional Lag BaOmer feature. Since this is the day of joy of Rabbi Shimon bar Yochai, there are major festivities in Meron, the mountain village in northern Israel where he is buried, with tens of thousands of pilgrims pouring in from all corners of the world to rejoice together in unity. Read more about Meron. All over the world, it is customary to spend the day outside, enjoying the natural beauty of G‑d’s world. During these outings, it is customary to play with bows and arrows. Read about the reason for the bow and arrow here. music is playing and people are singing and dancing with abandon. little boys who turned three during the Omer period but did not have their first haircut (upsheren) due to the mourning laws, have them today, often at Meron. Recognizing the fiery spirit of the mystical teachings that are celebrated today, bonfires are kindled. Get some friends (and a guitar) together, and it becomes a wonderful opportunity for singing, sharing and enjoying each other’s camaraderie. Customary foods for the day include carob (which miraculously sustained Rabbi Shimon and his son when they were hiding from the Romans) and eggs (a sign of mourning). 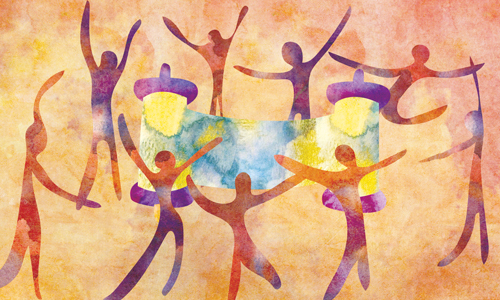 Beginning in the 1950s, the seventh Lubavitcher Rebbe, Rabbi Menachem Mendel Schneerson, encouraged Jewish children to join together in grand Lag BaOmer parades as a show of Jewish unity and pride. Held in front of the Lubavitch World Headquarters in Brooklyn, New York, the parades attracted—and still attract—thousands of children from all walks of life. In 1980 the Rebbe gave instructions that Lag BaOmer parades and children’s rallies should take place not only in New York, but across the world, especially in Israel. Thousands of children participated in the tens of rallies that took place that year, and to this day, Chabad organizes hundreds of Lag BaOmer parades around the world every year. Read more about the Lag BaOmer parades here. 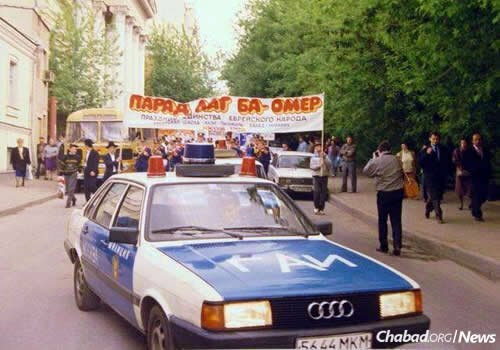 A 1992 Lag BaOmer parade outside the iconic portico of the Moscow Choral Synagogue in the center of the city. Chabad's Jewish day school was housed at the Moscow Choral Synagogue until space ran out in 1993. I'm learning, even the most difficult times we can cope with. I'm vulnerable to the world, with what we believe in, the ability to cope. I'm less able at present, but I have time to put my life in order. At this special time, it's a good pass time. I agree. During the last year I've had health issues. Feeling so unwell and lost. This relationship with something, that is like no other. Its constant, no matter how I feel, it reasures and soothes my very soul. Love and respect for another human being. I have been writing on relationship breakdowns, how this echoes, as I write. One of the first people in documented Jewish history who we find celebrating the date of Lag Baomer as Reb Shimon's date of passing, was the Arizal, the foremost sage and Kabbalist who lived in the 16th century. After and due to him came the numerous other Torah scholars and leaders who turned this day into what it is, and who've commemorated the various customs associated with it, all of them stressing the date of his passing as the reason for the celebrations. Slight correction Ahavat Yisrael does not mean "one's fellow," as if to say we are to love all people. It means love "of Israel." It really should specifically say "love of one's fellow" in the Hebrew, as "love of Israel," by itself, is not in the true spirit of what God's love is, and its all-encompassing nature. We Jews forget, very often, that we are not the only beautiful creations of God. Excellent question (being that tonight is Lag Baomer, I am responding to your two year old post, hoping that you see this). Your answer: In truth, the students stopped dying *on* Lag Baomer (see Shulchan Aruch Harav, Orech Chayim, Chapter 493:5), which is why the holiday was established on Lag baomer.